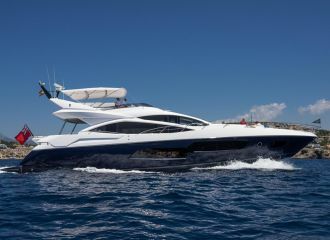 This stunning Princess 64 flybridge yacht is ideal for a yacht charter in the Balearics. 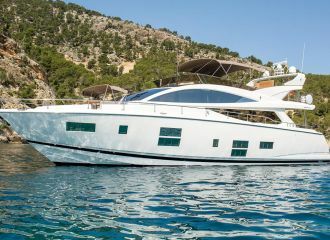 The yacht makes use of all available space providing guests with different options for relaxing, sunbathing, entertaining and dining. 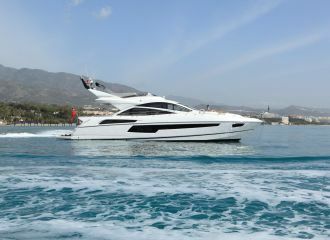 The aft deck features a large dining table which seats comfortably eight guests. On the flybridge, guests will find a wetbar as well as a dining area. 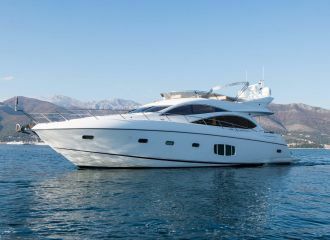 This Princess 64 offers accommodation for up to 8 guests in 4 cabins: 2 double, 1 twin (convertible into a double) and an additional cabin with bunks.